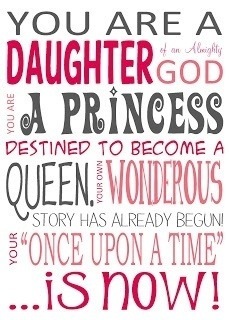 YOU are a princess! Don’t allow anyone to treat you as anything other than that. It doesn’t mean you should be given everything you want, but you should be given God’s best. Wear your crown proudly to remind yourself to work daily to be God’s best for the prince he has for you. Be careful not to rush a relationship that clearly isn’t right just for the sake of saying you have someone. Remember, Cinderella didn’t meet her prince until the end of the story. Focus on your King, and grow in his loving presence and, Sweet Princess, your prince will come when you least expect it. And you will feel like royalty. Be patient, and focus on bettering yourself rather than seeking out someone who God has already planned on the perfect time and place you will meet. Keep your head up with a focus on God because when you look down, your crown is likely to fall. Look up, straighten your crown, and wear it proudly. Who knows; maybe that’s what your prince will use to identify you as his princess.